Everton returned to form in style, inspired by the brilliant Pienaar and Mirallas, the Blues overpowered relegation threatened Reading to win 3-1. With attention turning to a potential return to Wembley, Everton warmed up for the FA Cup Quarter Final with a return to Premier League form and in turn reignited the push for European football through their league placing. With Jelavic continuing to struggle in front of goal, Everton’s midfield took on the responsibility for goals to ensure the Blues won their first Premier League match in four. 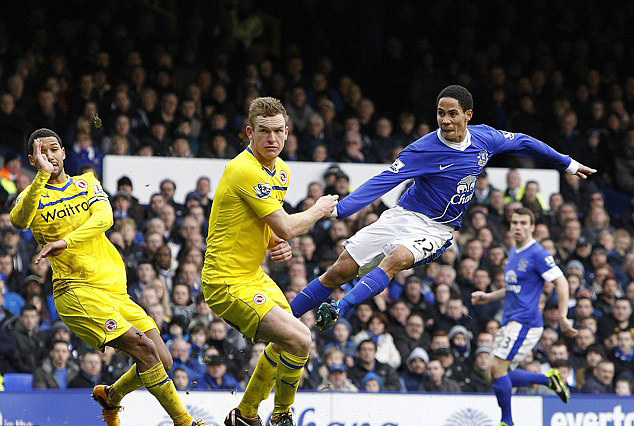 The Toffee’s wide-men led the charge, with Baines, Coleman, Mirallas and Pienaar in imperious form. Marouane Fellaini may have grabbed the attention of Match of the Day and their inept coverage, but in truth it was the other Belgium in blue who inspired Everton to victory. Kevin Mirallas has certainly taken on board the challenge laid down by David Moyes to increase his goal return and has scored in each of the last two games. Pienaar has received a new lease of life and Everton’s attacking play has started to resemble their early season form that threatened to take the Premier League by storm. There was a nervous air around Goodison prior to kick off, with the defensive frailties that cost the Blues victory as Carrow Road still fresh in the mind. Matters were not eased, when the team news confirmed that Tim Howard wasn’t fit to continue his remarkable run of unbroken league appearances. Jan Mucha took his place in goal and was set to keep a clean sheet until Reading pulled a goal back late on, with Robson-Kanu left unmarked in the Everton box. Further bad news arrived as early as the fifth minute, when a shocking late challenge left Jagielka nursing a terrible gash that will require surgery and is likely to keep the England international out of action for at least a fortnight and when Adam Le Fondre struck the post with Reading on top and the score nil-nil many feared the worst. However that moment brought Everton to life and before half time the Blues were in front. Fantastic play from Seamus Coleman on the right, created the first, with his centre into the box perfect for Fellaini to head home and give the Toffees a half time lead. Everton’s second was quite superb, Pienaar ran from just inside the Reading half, cut past two players on the edge of the box and fired powerfully past Taylor in the opposition goal. And the lead was quickly extended when Kevin Marallas was slipped through by Pienaar to put the game beyond the reach of the visitor. Everton had a number of further chances, but were pegged back late on by the Royals and with Reading’s reputation for strong comebacks the end of the game was greeted with relief. With the final whistle, thoughts quickly turned to next Saturday and the visit of Wigan. Cup progress is essential and on this form, the Blues will return to Goodison full of confidence.